Sir James Tynte Agg-Gardner JP (25 November 1846 in Cheltenham – 9 August 1928 in Carlton Club) was an English brewery-owner and Conservative Party politician from Cheltenham in Gloucestershire. An early supporter of women's suffrage, he was Member of Parliament (MP) for the Cheltenham constituency for four separate periods between 1874 and 1928, serving a total of 39 years in Parliament in which he made only two speeches in the House of Commons. Victoria Cricket Ground This ground was opened by Dr. W. G. Grace on the 21st June 1897. The original pavilion was given to the club by Sir James Agg-Gardner, the well known local benefactor. The Cheltenham "Looker-On" reported at the time "the ground is four acres and a half in extent and cost in laying out about seven hundred pounds". In 1963 the west end of the ground was sold to finance the existing pavilion. 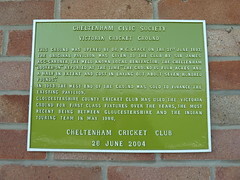 Gloucestershire County Cricket Club has used the Victoria Ground for first class fixtures over the years, the most recent being between Gloucestershire and the Indian touring team in May 1986.